It was the end of another typical day in Crawley. Mr Dalek had exterminated all the toys for the day. The Scooby Gang had been killed around midday, because Scooby had been throwing Scooby Snacks at him - Mr Dalek couldn't stand Scooby Snacks, they had been giving him a bit of an allergic reaction as of late. The Animaniacs continued to infuriate Mr Dalek, by rhyming every word with every other word, so off they went. Brain had been killed because- well, just because. Yes, all the toys had been killed- all except one. Pinky was on his knees, begging for mercy. "Please, Mr Dalek! Just once, just this one night, why not show a little compassion? This room would be a better place if it weren't for your constant random exterminations! What do I have to do to stop you murdering us all?" Mr Dalek thought about this. Perhaps Pinky had a point. 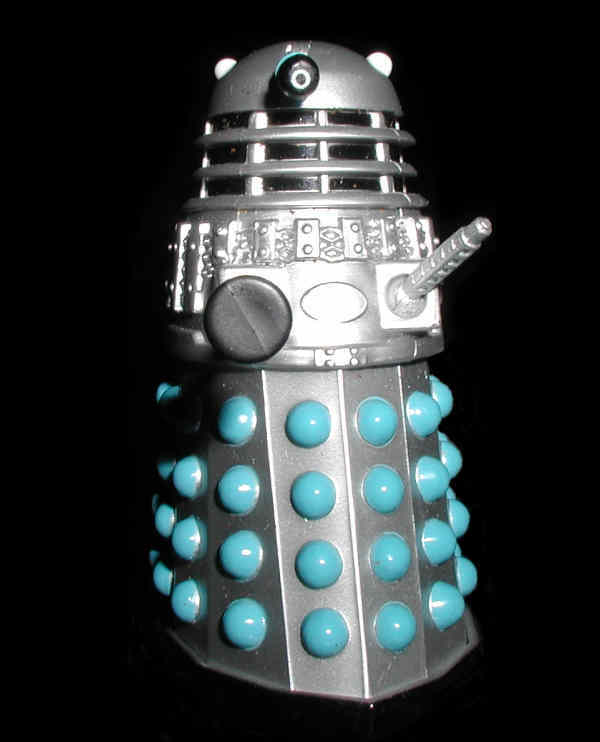 What if, for a small amount of time, he gave exterminations a rest? He was feeling a little tired, after having to deal with the events of the last few years. And if the foretold events of 2011 turned out to really happen...he'd need to save a lot of extermination energy for that. There was a knock at the door downstairs. Mr Dalek heard Adam open it, and greet the familiar voices of his friends. Aha! This was what Mr Dalek had been waiting for. He rushed out the room. Pinky breathed a sigh of relief. It looked like he wasn't going to be exterminated after all. Pinky wandered around for a bit, then went for a nap. Mr Dalek crept to the top of the stairs, and listened. Tonight, Adam was recording the Staggering Stories thingamajig, and Mr Dalek had taken to listening in on these recordings. Recently they had been discussing classified information regarding the Dalek's greatest enemy, The Doctor. Mr Dalek would normally watch the shows himself, but had been busy with his exterminations recently. He had made certain to listen in this time though, since they were going to be discussing the Daleks themselves! Perhaps his leaders had instructions for him. Perhaps something terrible had happened, and he'd have to save them. He'd been stuck in Crawley so long, he'd forgotten what it was like to rule the world. Or had he never known in the first place? He pondered this for a while, as the humans below him discussed 'news'. Come on, he thought, get to the good stuff! “And now.....Doctor Who!” said one of the humans (they all looked the same to Mr Dalek). At last! Mr Dalek readied himself for the information. He listened carefully, for about half an hour. What was this? A new design on the Master Race? Fascinating. Were they bigger and better than before? Were they a brilliant new take on the old, classic idea. More importantly, would he get to upgrade? He listened on, to see what the new Daleks were like. This was excellent news! If the humans hated the new Daleks for their point of view (the wrong one), then they must be wonderful from his point of view (the right one, of course)! He was almost waving his plunger in the air with joy, when a passing remark from the one known as Real Keith ruined everything. A shiver went up Mr Dalek's ray gun. Was it possible? Were the Teletubbies returning- but this time, in Mr Dalek's very own form? He'd need to be very wary of them, should they decide to exact their revenge upon him. But then, why would they? If they wanted to kill him, why go to such lengths? And it wasn't as if he'd even seen another Dalek besides himself for years! Mr Dalek relaxed slightly, safe in the knowledge that there was no way that the Teletubby Daleks – if that's even what they were – could find him. He was getting worried over nothing. Who was that? All of Adam's friends had left, and it was a few hours later, Mr Dalek had been spending the time in Adam's room, listening to Radio 1. He preferred Radio 1, since there was more music, and less voices in his head telling him to die than Radio 4. He had looked for Pinky, hoping to exterminate him to relieve some tension, but had found him nowhere. He had been 'relaxing' to the sounds of the latest chart hits, when the knock interrupted his aural suicide. Mr Dalek trundled out to investigate, and peeked over the stairs. Adam walked down the hall, and opened the door. Or at least, that's what it looked like to Adam. To Mr Dalek's highly trained ability to look downward, he could see something that made his heart sink. There were four toys, all different colours – one red, one blue, one orange and one yellow. They were very familiarly shaped. Could it be....? The toys zipped in without Adam noticing, and he shut the door and stomped away, muttering. The toys – well, let's not beat around the bush. We all know they're Teletubby Daleks, right? Good. – The Teletubbies stalked their way around the hall, fanning out in a surveillance pattern. Even from the top of the stairs, the voice that Mr Dalek heard struck terror into his tentacles. “Find Mr Dalek immediately, and have him exterminated for his inferiority!” grated the one that looked like the leader – the yellow one. “We obey!” chanted the others in the same horrible tone. Do I sound like that? wondered Mr Dalek. Never mind that for now, he needed to find somewhere to hide. He rushed back into the room – but not before seeing the red Teletubby advance up the stairs – and practically bumped into Pinky, coming the other way. “What's up, Mr Dalek?” asked Pinky. Pinky blinked. “Do you mean that, upon accidentally condemning the Teletubbies to death on television, they swore their revenge and, in their dying moments, took a very quick scan of your body and created five Teletubby-Dalek hybrids, sending them to your location. However, in the rush of the scan, they didn't have enough time for all the details, and so ended up slightly exaggerated in their size. Their logic was that, psychologically, you would find it impossible to destroy one of your own kind, whereas the bloodthirsty Teletubby in them will have no such qualms about killing you. One of them is currently coming up the stairs and is about to kill you, and so you need to find somewhere to hide. Right? Mr Dalek turned around. There, outside the window, hovering serenely, but with a tangible air of menace around him, was one single Teletubby Dalek. It wasn't one of the ones Mr Dalek had seen earlier. This Teletubby was white, and instead of a plunger, had attached a battering ram to his body (budget cuts, eh?). Glass shattered around the whole room. The white Teletubby floated in, and landed next to Mr Dalek. “It is time, Mr Dalek,” the Teletubby rumbled. “Prepare to be exterminated!” He aimed his ray gun, and fired- straight at Mr Dalek. Mr Dalek looked away and braced himself for the impact. Pinky lay there, on the floor. At the last moment he had jumped in front of the blast, which had killed him. Mr Dalek wondered why he had done this. He thought that Pinky hated him. He glided over. “Pinky, are you alright?” Clearly not, thought Mr Dalek. Pinky mumbled somethng almost incomprehensible, that sounded like “Stoopid backs”. What? Oh, never mind. Mr Dalek took the opportunity, and bolted out the door. There would be time for solving cryptic clues later on. There was no sign of the Red Teletubby anywhere; perhaps it had gone downstairs again. Mr Dalek looked around for a place to hide. Aha, the bathroom, Mr Dalek thought, as he saw the door in front of him. Perfect. Mr Dalek sneaked through the gap in the door, and pushed it behind him. He turned around, and looked at the room before him. For a moment he was stunned, but he recovered, and forced himself to check his visual output feeds, too see if what he was seeing really existed. Everything was working fine. So what the hell is this? Mr Dalek thought. In front of him, he had been expecting to see a bath, a shower a toilet and a sink. This was not what he saw. Mr Dalek wandered among the experiments being conducted. Why had he never seen this place before? And, more importantly, was there anything in here he could use to kill the Teletubbies? He searched high and low, but could see nothing. Mr Dalek's thoughts were broken by a sudden crash from the other side of the lab. The door burst open, and the five Teletubbies rolled in. They surrounded Mr Dalek, and looked upon him. For about one second, Mr Dalek gave up. He understood that there was nothing he could do, and decided just to let these imposters destroy him. Then, one second later, he realised what he'd just said. “Imposters? Imposters?” Mr Dalek considered this for a second, then almost jumped with joy. Sort of. The Teletubbies stood there looking at Mr Dalek, like good enemies do whilst the hero works out the plan. “No, wait! Pinky said that it wasn't an exact copy, you exaggerated some of my features; that's why you're bigger than me! And oh, of course, that's why you killed Pinky. You could easily have aimed your laser bolt past him and hit me, but you didn't! You took my need to exterminate the toys and made it ten times stronger! “ The clock on the screen behind the Teletubbies read 11:58:57. The shadowy figure stepped out the doorway. It was Pinky. As he walked over, the Teletubbies began to disintegrate. “Help us, Mr Dalek.....” they cried as one. Suddenly, everything disappeared. It was as if only Mr Dalek and the white Teletubby existed in a void of blackness, surrounding them both like a thick fog. “There is more coming to kill you. You will never be safe. We were merely pawns in the hands of a greater evil. And when the end comes.....” The Teletubbies voice faded into nothing, as the last remnants of him disintegrated into nothing. Mr Dalek was aghast. The song burned his mind for an instant, then silence fell. Pinky was calling him, but he couldn't answer. He was frozen. Something in his brain registered with the song, and it frightened him. For the first time ever, Mr Dalek was scared. No copyright infringement intended, Doctor Who and the Teletubbies are both copyright the BBC.